Why YOU need a GPS when you hunt (or travel)... -- Steve. 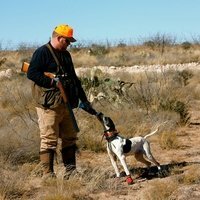 Late January 2007, I was out hunting in West Texas on my quail lease with my good friend and the Director of SportDOG, Mr. Lance Tracy. We had hunted most of the day and things were starting to wind down. We had just let the dogs out to check on a covey that I had found earlier in the year. They fed around 100 to 150 yards off the road and I expected to find them close to the same spot we had flushed them a few weeks earlier. It was around 4:30 in the afternoon and we had only been out of the truck for about 10 minutes when the dogs locked up. The covey was in really short cover and they flushed before we could get to them. My older dogs were on the ground and they are not steady to wing or shot. When the covey busted, they followed. Some of the birds crossed a fence, and my 10 year-old female pointer, "Em," went after them. About half the covey went on our side of the fence, so I called the dogs back in to me and headed in that direction. When Em came in she was limping. I assumed it was sand spurs so I went to her to check. Blood was running down the front of her right leg, and it was obvious that she was hurt. The cut was around 2 inches wide. I carried her back to the truck and patched her up, but I didn't want to go long with out getting her stitched up. My quail lease is about 60 miles south of Lubbock, Texas, and it's about 35 to 45 miles to the closest towns. I had a phone number for the vet in the closest town, but it was 5:00 pm on a Saturday and he was not open. I called my brother, Rob, back in Starkville, MS to see if he could Google me up a vet that had weekend hours. When I got him on the phone, he asked if I still had his Garmin Nuvi Car GPS system with me. I did, so he walked me through the search feature on the GPS. I typed in "Animal" and it searched for every business close to me that had the word Animal in the title. The third listing was for a 24hour and weekend Vet based in Lubbock only 65 miles from me. The GPS gave me the address and the phone number. One quick call and I had them on the phone. The Garmin Nuvi also gave me directions and took me right to their front door in no time flat. The Vet got Em sewn up, and I was headed back to my hotel. While her wound was not life-threatening, getting it treated fast was better for all of us. My dogs hunt hard and taking care of them is really important to me. The Garmin GPS made finding a vet possible even when I was in the middle of nowhere with no idea where to start looking. A GPS unit is a really valuable piece of gear and I'll have one with me from now on when I hunt or travel. Lucky for me, the Garmin Astro 430 GPS can have all the features of a standard car GPS and with the right maps, I can use it in place of a Garmin car GPS unit. This will save me several hundred dollars since I now don't need one for tracking dogs and one for keeping me from getting lost.